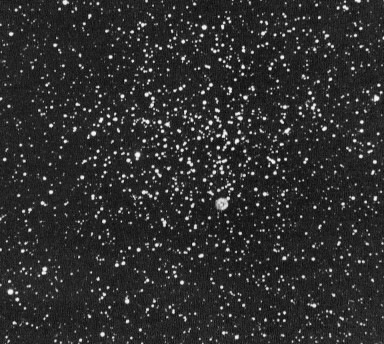 Messier 46 (M46, NGC 2437) was the first object Charles Messier discovered after he had published the first edition of his list (M1-M45). He added this one to his catalog on February 19, 1771, three days after presenting it to the academy, together with three more Messier objects, M47, M48, and M49. 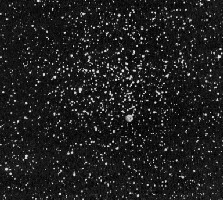 The cluster is very rich, with 150 stars of mag 10-13 and probably a total population of over 500. The brightest of these stars are of spectral type A0, and each about 100 times more luminous than the Sun (the brightest is of apparent magnitude 8.7). This indicates an age of about 300 million years. The members are scattered over an angular diameter of about 27', corresponding to a linear extension of 30 light years at the cluster's distance of 5,400 light years, and are receding from us at 41.4 km/sec, according to Baade. M46 is classified as of Trumpler type II,2,r. the radial velocity of NGC 2438 is about 77 km/sec recession, which is 43 km/sec different from the cluster's value and would not allow the cluster to hold it, even if it were at the same distance. Woldemar Götz, however, gives derived distances of 4,600 light years for the cluster and only about 2,900 light years for the nebula, which would mean that the planetary is a foreground object. planetary nebulae are only visible for short times and fade quickly; most of them are visible only for a few 10,000s of years before their material has volatilized into the surrounding interstellar space. planetary nebula are late states in stellar evolution, which occur only for comparatively low mass stars of less then 3 solar masses. These stars, however, need more than a billion years for their evolution until they eject their envelope to form the planetary, which is much longer than the age of M46 (more massive stars "go supernova"). However, this last argument is questionable, because some young clusters as the Pleiades (M45) contain a significant number of white dwarfs, which must have evolved from more massive stars; these stars must have lost most of their mass during their evolution, probably in the form of strong stellar winds in their Red Giant phase, and must have gone through a planetary nebula phase.